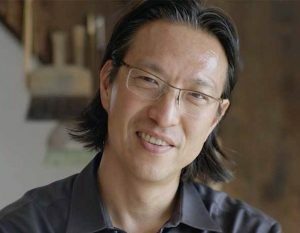 Makoto Fujimura is an author, speaker, and 21st-century contemporary artist. He is Director of the Brehm Center for the Arts at Fuller Theological Seminary, and founded the International Arts Movement and the Fujimura Institute. Mako’s artwork has been exhibited at galleries around the world, including Dillon Gallery in New York, Sato Museum in Tokyo, The Contemporary Museum of Tokyo, Tokyo National University of Fine Arts Museum, Bentley Gallery in Arizona, Gallery Exit and Oxford House at Taikoo Place in Hong Kong, and Vienna’s Belvedere Museum. His books include Culture Care: Reconnecting with Beauty for our Common Life, Refractions: A Journey of Faith, Art, and Culture, and his most recent release, Silence and Beauty: Hidden Faith Born of Suffering. Mako has served as a Presidential appointee to the National Council on the Arts. In 2014, the American Academy of Religion, named Mako as the ’2014 Religion and the Arts’ award recipient.